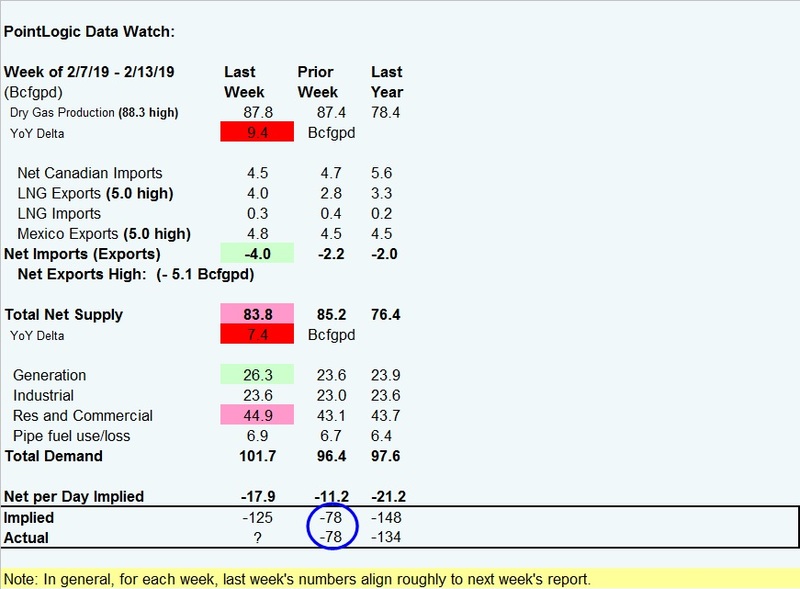 Market Sentiment Watch: China data kicking the year off much better than expected with January exports rising 9.1% (a drop of 3.2% was the consensus forecast) while imports were only off 1.5% (a 10% drop was expected; though imports from the U.S. tanked 41%). In energyland, due to reserve reporting requirements, 4Q earnings are spread out over a longer than normal quarterly time frame. This leads to dearths and gluts of reports. Today we get a glut of names of interest reporting as noted below. Some of our comments may be more brief than usual. If something isn't clear, please ask and we will respond or track down an answer. In today's post please find the oil inventory review (negative side of neutral as weeklies go), the natural gas preview (smaller number this week, then larger pulls into the back half of February; strip remains over sold), comments on a flood of names as noted below (pleased to see discipline actually materializing), and some other odds and ends. We get PPI at 8:30 am EST (F = 0.1% vs last read of -0.2%). We plan to carve out part of the ZLT for a VNOM position soon (during the quarterly reporting season). Please see our mini model in this past Tuesday's post. Crude oil closed up $0.80 yesterday at $53.90 after IEA maintained its 2019 demand forecast and the EIA reported a weekly set of data that we saw as on balance slightly negative vs expectations and OK in the scheme of how we see things unfolding this year. Net imports set a new modern history low, helping to avoid a blowout sized crude build as throughput tumbled well below record territory (something we see as largely seasonal but also run cut related on poor margins and therefore to be short lived). In the wake of the EIA STEO and the OPEC and IEA monthlies oil is actually holding up a bit better than we would have expected this week. This morning crude is trading up near a percent. Russia Watch 1: Bi partisan bill in the senate designed to sanction banking, energy, and entities dealing in Russian debt. It would impose sanctions on entities supporting oil development in Russia. Russia Watch 2: Novak says he expects Russian compliance with OPEC+ deal to improve in February saying volumes should be at least 150,000 bopd below December levels. Novak's message to Russian oil companies is that the deal is positive for them. He also said there is no plan to attempt to produce more to offset lost Venezuelan output. Nigeria Watch: The Delta Avengers are back and threatening oil infrastructure attacks if President Buhari is re-elected this weekend. Iran Watch: VP Pence speaking to European Union tells them to import no Iranian volumes. Natural gas closed down $0.11 at $2.58 (in line with last Friday's recent history low). We see gas as overdone to the downside but until we trough and get through spring, unlikely to mount a sustainable push over $3 (strip). This morning gas is trading flat. Street is at - 87 Bcf (Bloomberg) for today's report. Differential from WTI: ($9.47) vs ($11.90) last quarter (before derivatives and the uplift from firm transport). 2019 Capex of $3.1 to $3.4 B with D&C capital down 11% vs 2018. (on mid this is 2.5% below expectations). Stackberry Pad (stacked middle and lower Spraberry and Jo Mill) - second pad of 8 wells outperforming offset Spraberry wells by 35% and they are calling another 40,000 net acres derisked for "stackberry" development. A third pad is in progress and two more pads will be added late 2019 (look for questions on location inventory impact). Reserves: Drillbit F&D of $11.77/ per BOE vs $8.46 per BOE for 2017; they are unlikely to chest pound this year about that number. Divestiture Update: $865 mm non core sold in 2018; no comment in the release regarding remaining divestitures but they do note guidance for the Eagle Ford and other South Texas assets for volumes. Semi Annual dividend doubled to $0.32 per share. The $2 B share buyback announced in December. $328 mm (2.4 mm shares) bought back under the new program. Look for color on the call on their appetite if prices are above their $53 planning deck noted above (as to choices between buyback and spend more on the drillbit). Nutshell: Miss on the quarter on prices. Guidance is OK, getting more bang for the buck on lower wells costs but cash flow vs capex will likely be investor focus on the call and there's not much gap there on their $53 deck (but granted, there will be more vs where the Street is on oil now). Expect modest weakness early but for call to set tone going forward. It appears they are willing to grow slower and slowly edge towards more of a share holder return of capital mode focused on overall returns (ROCE focus). Oil was up 7% for full year 2018, less than expected. 4Q18 differential of ($6.68), that's going to be strong this year. But they are gassy, and gas came in at $0.63. 2019 volumes of 74.35 MBOEpd; but ... total up 9%, oil down 5%. Street was at 71.5 MBOEpd. 90% hedged at $48 floor. We do not own the name (exited at $8.77 in March 2018) and do not currently plan to re-enter at this time. Conference Call: Today, 8:30 am EST. Free cash of $865 mm. Street is at 435 MBOEpd. 1Q19 guidance is 390 MBOEpd with Street up at 415 MBOEpd. Balance Sheet: Not included in the release. Not a name we own or have historically followed. Largely paying attention for non followed player growth, budgeting, as well as for color on the LA EFS play. Guidance: Capex to be at low end of previously guided range, down 20% from 2018; capex expected to be within cash flow. Balance sheet: Improved to 2.2x net debt on standalone basis. AR remains fully hedged for expected 2019 natural gas production. We do not own Antero having exited the position in May 2017 for $20.40. It may be time to take another harder look here. Conference Call: Today, 11 am EST. OII (Unowned Service) Reports Essentially In Line 4Q18 Results; Guidance Suggests Stability and Modest Improvement. EBITDA was positive for all segments; ROV's continue to be the overwhelming bulk of the cash flow. 2019 EBITDA guidance range of $140 to $180 mm; they are guiding to a return to positive cash flow after a negative 2019 with capex of $105 to $120 mm. Subsea Projects - "better" results expected in 2019. Dayrates appear to have stabilized. Subsea Products - strong order intake late last year and to date in 2019. ROV's - increased days on hire, better regional mix, and stable pricing. 1Q19 guidance is well below Street due to "unallocated expenses". This is a function of performance based incentives picking back up as they see increased offshore activity this year. It's been years since they did this. Interesting. We do not own the name, we pay attention here for signs of improvement (or not) in the deepwater macro and this is more upbeat a release from them than we have seen in the last few years. Reserves were up 28% to 1.86 Tcfe. Given the approaching and now fully approved merger in a few weeks this will be moot. This entry was posted on Thursday, February 14th, 2019 at 8:07 am	and is filed under AR, OII, pxd, Uncategorized. You can follow any responses to this entry through the RSS 2.0 feed. You can leave a response, or trackback from your own site. LPI (unowned) call in 5 minutes, notes to follow. Slowing pace as noted in the post, making this a transition year. Plan is to hold oil volumes flat from 4Q19 levels in 2020 and 2021. Pullback on drilling allows corporate decline rate to fall making for lower maintenance capital needs to do this. Revised type curve type curves are on slide 6 (oil cut goes from 51% on the first five years to 39%) … happy we are not in for this. They note that going to wider spaced wells will drive an inflection in oil, better type curve vs the tighter spaced wells, the program they are wrapping up now. – hedges – 90% is avg floor at $48 but has maintains upside. Q) what's wider space history – how many wells, when do we see the better results out of the widers, 2020 or sooner. A) pause … we try to play middle of the road, where we are today this is how we see it. Will circle back to this transcript. Harvest on the tape noting they are done selling their MGY shares, all 4.2 mm sold. Pressure relief. Assets, strategy (returns first, sharing cash flow w/ shareholders), and ability to differentially execute. Capital discipline definition – ensure every $ advances returns at enterprise level, prioritize sustainable free cash at conservative prices. Emphasize high value oil growth to keep margins high. Must support sustainable CF and not in connection with asset sale proceeds. Says for many this is aspirational, for Marathon this is reality. Notes the unchanged $2.3 B capex for 2018 that didn't change. We stuck to the #. – returns, free cash, and return of cash flow to shareholders … production growth is an outcome (instead of free cash is an outcome of growth … I like this guy). Working to extend the core of Bakken and EFS – working on "hundreds" of potential location adds – extension areas, spacing, leasing around existing. Noted the emerging LA Austin Chalk. PXD – "Expect modest weakness early but for call to set tone going forward." Set to open down 4%, a little more than it was up yesterday. EQM and ETRN agree to a IDR elimination deal. ETRN will remain the GP and own 60% of EQM, but with no IDRs. Deal closes this month. Q) Bakken – details on meaningful reduction in CWC, is that sustainable. A) $5 mm, we didn't give this until today. We are working both productivity and capital reduction side. A) minor differences, not much different in the completion. We have delivered this kind of cost in other areas of the Bakken as wel. Teams are charged up to continue this and improve it further. That's $5.0 mm for a 10K' lateral. Nice. Oil set to open lower now, back to $53.50, Brent about $10.25 higher. MRO – positive analyst tone, lots of great quarters guys. TELL: Signs MOU with Petronet (India's largest LNG importer) for LNG equity stake and volume commitments for its proposed Driftwood LNG export facility. Thanks Nrgy – on calls through lunch but will circle to it, EQT (unowned) didn't report in time for me to review. VWDRY – breaks to new 52 week high on the open. PXD opens down 3%. Call in 30 minutes. Nrgy – the AR (unowned) quarter looked interesting. We sold it basically double current price. Time for a new look. Tom – there were interesting tidbits in the OII (oh eye eye) (unowned) comments. Can't look, reason for Broad market drop on the open? re 15 – TPIC should be next up to do that. Earnings later this month. PXD – off 2 to 4% pre call now as bottom fishing continues. MRO (unowned) – up 6%, call in progress, very positive. RE 17: Yep, but the market doesn't like AR (unowned) early. AMGP (owned), on the other hand, is liked this morning. AMGP and AM set to combine in early March. This could be affecting AR (some arb trading). AR is tempting under $9, near all time lows. re 21 – agreed, and I don't really mean today, but it's time for me to update it in the next few weeks. A) remarkable success in EFS and Bakken- 3x uplift in productivity in the extension areas … so you get additional sites as well as just improved thoughts on what you had there before as potential locations. A) Testing 8 wells per section in the L WC vs base case of 3 with an upside case of 6 … but focus for now remains on the U WC. EFS – recognize that the potential is hundreds of locations, have dedicated trials of concepts, will want to see longer term performance – hard to put a time scale on that but teams see potential for hundreds of the mature assets. On the Permian – very dense, up to 10 or 11 benches – it will be a different point in time for different intervals – 2/3 of program U WC and then meaningful tests of other intervals. Q) deal market thoughts – described as a clogged drain – definitely a buyers market – are the returns for acquisitions approaching. A) always will look at small bolt ons that give locations and not necessarily bring PDP production – don't want to add locations that are high return some day but are impactful now. So it's a high bar. Q) free cash flow by asset – Bakken and EFS are but the other two are not, correct, and if not when turn. A) we have assets that span the full development cycle – Bakken and EFS are fcf positive across range of prices; the SCOOP/STACK are clearly moving towards self funding, and N Delaware – still aways from that, team on right trajectory, strong growth but on small base and it is the only area that still have leasehold obligation. 17 Z Noticed some sellsiders warming up to the RIG backlog. Looks like trades only. RIG now mostly only UDW rigs with their recent mergers. Weak retail sales reason for market lower. MRO – service cost inflation ? across all service lines – flat to a little bit of deflation. re 25 – thanks for the color … rates still in gutter last I checked, maybe stabilizing? re 26 – thank you. PXD about to start. Down 3% at start of call. LPI (unowned) – down 3% now, would have expected more dip, maybe mostly flushed out now. – sand – $350 to $400 K per well, also sand change out allows big save on chemicals. focus on returns – ROCE above peer average in 2018 (9% PXD vs 6%) – this is due to low cost acreage – our acreage put together in the 1990s at $500/acre, done litte acq since. return of capital – touting the 700% growth in the dividend in the div since 2017 (start with very small base, that won't continue at that rate) and then the buyback. highly repeatable program – slide 12 shows footprint. Slide 13 – slide that often gets ignored – cumulative 12 month oil production – best in class. NG inventories in 10 minutes. We don't need to do large acquisitions to grow, unlike some of our peers. Sorry PE, not in the cards that they be your guys. Going to Q&A 28 minutes in …. No change to our trough thoughts of a mid point of our ranges of 1,500 Bcf and peaks under 4 Tcf this fall. Q) the market isn't paying for your model … do you think maybe you should slow down growth, analyst notes Marathon stock price reaction to their moves. Maybe slow more and buy shares more aggressively. A) we are slowing down. we are going to keep debt to < 1x, didn't really say if they would use the balance sheet to buy shares. Repeating they are on track to get to the ultimate goal of free cash generation that allows more share repurchase and higher dividends. A) we came in hot on capital because we were so efficient, so we kept going, then had some land and gas processing expenses that hit in 4Q, so we came in hot, but that's behind us. Looking at 2019, the costs are largely contracted for sand, for pressure pumping, this is contractual. – that's probably about as good an answer as he could give. A) the results have been just as good, no reason not to take advantage of cost savings, have proven it. q) 2% inflation – lot of your peers are talking 5 to 10% deflation. A) it could be up 4 to 5% by end of year … labor will drive that higher. Have not seen much this year including rig costs are lower (tied to oil prices) but expect when the pipes open up for activity to increase and we all see the DUC counts. EQT ccall going into Rice claims in detail; also have many slides with Rice claim/EQT response side by side. Replay only last 1 week = not shareholder friendly guys. A) this is the first year that all areas are dialed in to specifics by areas, not 3.0 or 3.0+, using machine learning to set that. not on the lower mesh sand (less coarse) you get to use less gel, surfactant, so you get the lower fluids costs and yet not seeing a change in well performance (says our data and peer data confirm no impact). A) not only stackberry, but also for co-developed WC A / B – operations efficiencies and best way to avoid parent child. The only downside is the longer cycle times. A) 1Q will be higher, you have higher rigs, and you don't get sand savings until 2Q. 1Q will be higher than run rate of 2Q-4Q. Will help you model offline. Q) GS wanting to know 2019 capex won't rise. People don't trust that they won't lift it again. A) they said what gets focused on gets fixed. THEY REALLY NEED TO NOT LIFT CAPEX THIS YEAR. re 35 – thank you RMD – did you see the LPI (unowned) stuff, reminds me of Approach … so much for the "Earth Model"
We don't consider the 1 mm barrel target as the main driver. A) 3 well takes about 170 days. For each well you add to a pad you add 30 to 40 days. Only a small % is 7 to 8 well sized pads. the average was 150 days and it goes to 200 days this year. A) we use $53 because it helps discuss in light of US industry … understand we are talking about $60 Brent for the budget … good point. Jumping to AR (unowned) call – will circle to OII (unowned) this afternoon. PXD mgt sure seems to see higher oil prices in 2019. If they do climb from here PXD needs to keep capex steady and let the FCF roll in. re 39 – they are using $60 Brent. Brent is $64 now. Agreed your last. 1 additional stage per day = $200K per well savings. That puts significant downward pressure on the budget. #1 NGL producer with significant export capability, #5 NG producer in U.S.
Budget does not include further efficiency gains nor deflation thoughts. Noting the balance sheet down at 2.2x and big growth last year, strong margins. – on standalone – debt will be our debt – not consolidated, so screens showed inconsistencies between sellside analysts and investors. Big fan of names that deconsolidate and simplify. 4Q18 – record volumes, 17% seq growth – we will get an updated cheat sheet out here soon. PXD Like that they quoted $400mm higher CF for every $5/bl increase in price. I will be using their average $136 buy back price as my average down number. Lowest break even cost in the Permian sounds good to me. Z Thanks again for your great notes. What kind of grade would you give this quarter? Anyone why is PE not joining the party lately ? Noting new macro slide show on their site. Slide 12 today summarizes. Sees strip as too low (hey, you and me both pal). RE 41: That comment about screens showing inconsistencies between consolidated vs stand-alone debt is an important point. The simplification resolves that and makes evaluation easier. Less than 4 weeks away from that event now. re 43 – it looks a lot like PXD and FANG – 4Q drop, bounce in January, basing into earnings. A lot charts look pretty similar. They guided late last year, what we have not really seen for most of these guys is the combination of better WTI from the post OPEC+ meeting lows and the substantial destruction of the Mid-Cush diffs. A) we used to be able to buy about 0.5 Bcfgpd to buy and sell, collect the spread, and offset FT charges for not being full. Right now spreads are small but notes spreads will improve as pipes in the area fill up. Said its not in the guidance at all so that's incremental if they buy and sell more to offset that cost. A) 200 days on the really big pads …. but using concurrent operations to keep it smooth, they can drill and have a frac spread both operating on same pad or be drilling out plugs on one well by drilling or completing other wells (I would guess they would suspend drill ops on the pad at the time of the actual frac though). Wyoming could say for sure. Anyway, their attempt smooth out the cycle. A) watching things – have seen things level off (same here, each week in the weekly data) – noting a big decline on the US reserve base. Will take more drilling. About half of the plays are dragged along by liquids but it's really the dry gas plays that are vulnerable, can they make up the decline? Call over 10 minutes early … positive tone here. Pretty clear from the call that if you are thinking PXD is going to buy PE you may be waiting forever. 37 LPI: the Gang Who Couldn't Shoot Straight. Ditto AREX though it looks like the Wilkes Bros. may have taken over. Hmmm. AR : – still own 31% of AM (unowned) . Reminds me of SN who IPOed with the wrong corp. structure, favoring the family over the shareholder. I pay no attention to AR's debt structure. TTI/CCLP may apply though; CCLP's debt in theory runs to the partnership, parent is not on the hook. But, big but, TTI's CFO largely comes from the CCLP distributions, starving CCLP of growth capital when demand is > supply (as now), so they lose share big time…total mess IMO. PE If a bigger fish were to make a 25% higher offer (approx $23/sh. ), could that be done on an accretive basis? Trump publicaly told TVA to consider all aspects in keeping the plant open. It's 49 years old, in need of repairs, economically poor, and not needed. That's about 1.15 GW, not sure if they replace it with NG or not … more trend, that's about the size of two decent sized nukes. re 51 – the Rice famity did that too. I did some work for Dan the senior back in the day. Definitely the smartest guy in the room. re 52 – a major using cash could. RE 50: Previous PXD comments that they have "decades" of low-cost core inventory suggested that PXD never needed a merger to grow. They don't, as they reiterated today. The real reason for an accretive merger is improved shareholder returns (through synergies and efficiencies). If they can use their higher-than-peer multiple to negotiate an immediately accretive deal through an all-stock transaction, even if it increases their extremely low debt metrics somewhat, the shareholders should benefit. A PE merger could do that (depending on price), and offer plenty of optionality going forward (so many synergies that can reduce costs and improve returns, not to mention potential asset sales). So PXD is correct that they don't need a big acquisition to "grow" and shouldn't entertain one. But to improve shareholder returns over the long term? Still conceivable. The market's current mindset won't like it though, even if it will (depending on price) deliver what it ultimately wants. re 57 – true, just some people talk about it being a good fit. I don't see it happening, now less than ever, much like I don't expect someone like EOG to buy anything. PXD is in its own little world. Looking at it from a return standpoint, they highlight the low low cost of their acreage in the calculation. Take in PE's acres and you skew that. It sounded to me like it's at all on their radar. re 46 Thanks on PE. CLR (unowned) – thanks for the heads up, stock gave back the gains, will look at after lunch. re 59 – I refuse to sell any down here in the ZLT. I am looking to carve out a bit of space for VNOM (currently unowned) and others will take a small nick and we may punt a couple of names from the portfolio which I see as dragging feet on discipline and covered by other positions (yes, I am looking at OAS as an exit these days, can replace with recently added WPX and not lose sleep and maybe a tax loss in SWN – we will see – had been previously thinking since November to shake up the portfolio more, started with the adds of wind, and there will be more soon on that front and in terms of more CF positive names like a Marathon). RE 58: Agree, though I'll bet they looked at it. One concern is that if you do have "decades" of inventory then how does that blend with the climate change movement after about 12-15 yrs? Adding to that inventory, without acceleration of production (which is not needed or wanted atm) adds risk to the portfolio in the out years–especially with millennial PMs (who don't like fossil fuels) taking control in that time frame. Perhaps this is yet another reason for the market shift away from growth toward shareholder returns. OK – really going to lunch now. Re 62 – will circle to in a bit. re 63 – they have to look at it if they are doing their fidu, just don't see them biting. re 62 – will try to get to that overnight. re64 Trump might not sign because poison pill provision allows local officials to veto their respective parts of the wall. re 66 – thanks for sending, will look. re 68 – yeah, that was a good call. PXD – no real move to sell it off, down less than 2% now. ECR up 7%, positive reaction to above guidance volumes. Note that the acquisition is not in those volumes and that the acquiree was what last drove guidance up with the 3Q call. Trump will sign the funding deal after all, but also intends to issue a state of emergency backed by GOP Senate leaders. Per CNBC. MRO: Z, do you have an estimate of what the TEV/Ebitda multiple is for MRO using the Q4 numbers and expected growth? re 75 – at $17.00 it's about 5.0x, have not seen a 4Q balance sheet yet, estimates on the working capital and debt. The EBITDA is Street, that could be a touch high, so maybe you are low 5x's on the 2019 numbers. Not a name I have historically tracked as it's part of the splits and is a bit above my normal size but not much. I'll have a cheat sheet out here in a week or so. And I do not have a model there at this time. Midland $1.10 over WTI today. Last September that was $18 under. Saudi Aramco halted oil production this week at Safaniyah, the world's largest offshore oilfield, in an unplanned shutdown that removes 1M bbl/day of heavy crude from the market, according to a report from Energy Intelligence. The potential impact on oil prices depends on how long the field is down, says Price Futures Group's Phil Flynn, and "the thinking is that the field produces heavy crude, and the world is short of that [type of] oil" because of the OPEC output cuts and U.S. sanctions on Iran and Venezuela. re 81 – Thanks. As a guess, would not expect that to last long, not really how they turn on and turn off production, and not to their benefit as a deliberate act given it will spike heavy prices, hurt world market margins and lead to great levels of run cuts. re 82 – said to be a damaged power cable. Also said potentially offline until March?! I saw that Aspiration Bank ad on NBC. Your deposits won't fund oil drills, or pipelines. Go to their site. They are pitching green mutual funds. The Redwood fund (nice name) – invests in good stewards of the planet – A few of their holdings Amazon, facebook, delta airlines, Amex, united health, ashland (specialty chemicals including for oil and gas, ha, oh, and wrinkle cream). Maybe a little cross promotional action there? Naaahhh. Couldn't be. What they don't have. Wind names. Solar names.